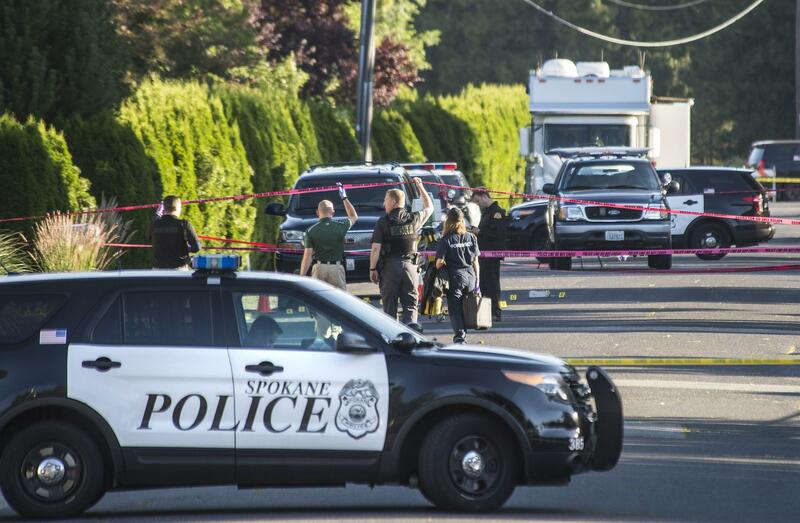 UPDATED: Thu., July 6, 2017, 10:36 p.m.
A man who was shot and killed Monday by police south of Spokane city limits had a history of stalking and threatening his ex-girlfriend, a sheriff’s sergeant wrote in recently released court documents. Daniel Craven, 53, who was shot multiple times by two Spokane police officers at about 12:30 a.m. Monday, had several recent domestic violence incidents with his ex-girlfriend – whose house was near the area where he was killed – wrote Spokane sheriff’s Sgt. Jack Rosenthal in a search warrant on Craven’s apartment filed Thursday. According to the warrant, officers were called to the same residence in the 5900 block of Mount Vernon Street on June 21 after Craven allegedly forced his way into the woman’s home and threatened her with a handgun. Police determined they did not have probable cause to arrest him at the time, Rosenthal wrote. After the Monday shooting, the woman told police that Craven, who lived in the same neighborhood, was walking around her residence early Sunday morning, but she didn’t report the incident to police at the time. She said her husband and Craven got into a verbal altercation and Craven later fled the area, the warrant said. Craven has no prior criminal history in Spokane County. When the woman called police early Monday morning, she reported Craven was in her front yard, damaging her lawn ornaments and fence and firing his gun, according to court documents. Within a minute of arriving in the area, an officer noted hearing gunfire. It’s unclear, according to the search warrant and a news release sent by the Spokane Investigative Regional Response (SIRR) team, if the officers who shot Craven saw or heard gunshots. The release did not detail any interaction between officers and Craven. According to court documents, the shooting occurred only a few moments later between Craven, who was on the side of the road several houses down from the woman’s house, and the officers. Following the shooting, as officers approached, they noted a semi-automatic handgun on the ground near Craven’s feet. According to the news release, the woman told police she thought she heard a shotgun being fired outside of her house. Detectives found a spent pistol casing near a grassy trail leading to the house. The officers administered first aid, and some time later Craven was transported to a hospital where he was declared dead. The woman provided investigators with a letter he had given her several weeks earlier that contained threats against her and her husband, toward whom she said Craven harbored jealousy, according to court documents. Neighbors in the area reported hearing multiple gunshots that night, but assumed it was fireworks. The SIRR team, composed of the Spokane County Sheriff’s Office, the Washington State Patrol, Spokane Valley Police Department and the Spokane Police Department, has taken over the investigation. The officers were wearing body cameras. Published: July 6, 2017, 2:43 p.m. Updated: July 6, 2017, 10:36 p.m.